Reuleaux RX GEN3 adopts compact size, ergonomic design and lightweight. 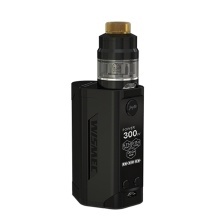 Having a big 1.3 inch OLED screen and brand-new interface, the GEN3 comes with three replaceable 18650 cells whose maximum output can reach 300W. Moreover, the GNOME atomizer that packs the new WM coils for optimal flavor and retractable top design for easy filling can perfectly pair with GEN3 in terms of appearance and performance. The flip-open cover with ventilation holes is designed for easier cells replacement and better heat dissipation. Note: The batteries are not included. Please buy 3*18650 batteries in addition.